Mussels and oysters are abundant and delicious along the coast, and seafood restaurants abound. With its long coastline, Brittany has a history of fishing, and its cuisine often features seafood. Perhaps most common on restaurant menus is "Moules Frites." This delicious meal of steamed mussels and fried potatoes is a standard, simple, delicious, and inexpensive. Oysters (Huitres) are another Breton treat, and one of the best places to enjoy them is in the small fishing village of Cancale, located on the coast of Brittany between Saint-Malo and Mont Saint-Michel. 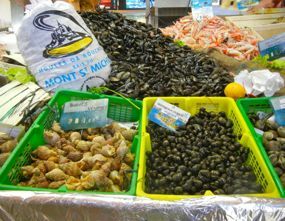 Seafood for sale in the market in Rennes, including mussels from Mont-St-Michel and bigorneaux (periwinkles). If you're feeling adventurous, try things like bigorneaux (periwinkles). Some restaurants will also offer a Plateau de Fruits de Mer. This large dish includes a combination of oysters, shrimp, lobster, mussels, clams, crabs, and other less recognizable shell fish like periwinkles and whelks. Usually a combination of raw and cooked seafood, it is served cold. The French love to dig into a hearty Plateau de Fruits de Mer and enjoy a nice chilled white wine along with it. And of course, menus offer a range of fresh fish and other seafood dishes. Bon appétit! 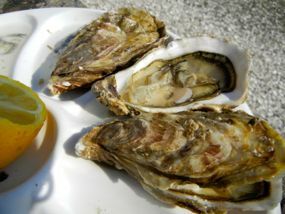 Above, Delicious fresh oysters in Cancale, Brittany, France.